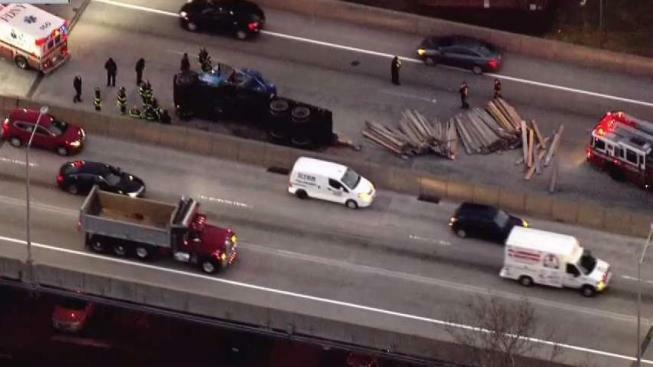 An overturned truck is causing a huge backup on the Brooklyn-Queens Expressway during the evening rush hour Wednesday. Chopper 4 over the scene showed the highway at a standstill after a truck rolled over on the northbound side, near Tillary Street just past the Brooklyn Bridge. There was lumber strewed across the highway, and traffic was only getting past on the right shoulder of the highway. The backup was seen up to Prospect Expressway, past the Brooklyn Battery Tunnel. The driver was being evaluated on the scene for injuries.